Children by his late wife Harriet, Arthur Richard, Eliza Tabatha, Edward Henry Freeborn, Alice Harriet. Children by his present wife Anne Maria, Hugh, Roland Simpson, George Donnet, Frank Simpson. Gives his Newton and Sudbury Estate's Suffolk to the use of his wife during her lifetime then son Arthur Richard, then to the remainder of his sons in tail according to their seniority. Then to other family desiring that it be kept in the family as it had come to him after many centuries. 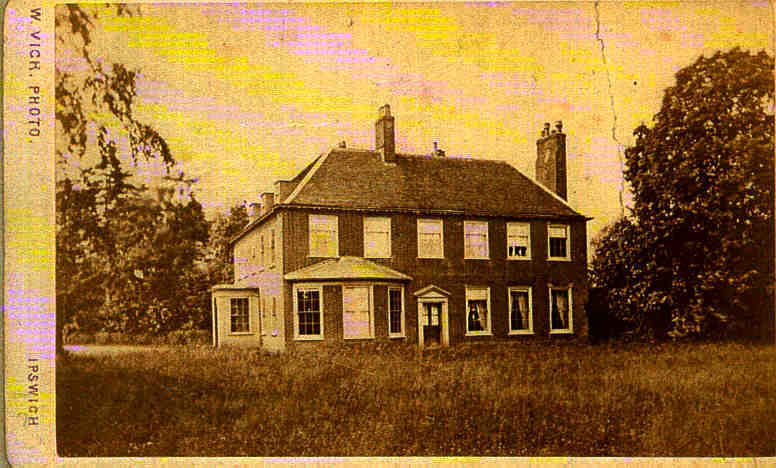 Property in Great and Little Maplestead Essex to the use of his wife for her life then to his Trustees or the survivors of them. £300 to be spent on placing these properties in good order. His wife £150 within a calendar month of his decease, and all his effects. To his son Arthur Richard his diamond ring. To his son Edward Henry Freeborn silver castors and a waiter once the property of Daniel Constable. To his son Edward Henry Freeborn a silver Epergne lately owned by his aunt Eliza and a picture of his great-grandmother Elizabeth Freeborn. To his daughter Eliza Tabatha a picture of her mother and two pictures by Herring. Two Alice Harriet a picture of her aunt Emma and a picture by Morland. His collection of autographs to be distributed among his daughters. To his son Hugh all his books with the hope that they assist his university career, also a picture of Sarah Alston Duchess of Somerset. To his son Rowland Simpson a picture by Mireveldt. To his son George Donnet a picture by Dunthorne and his best gold seal and key. To his son Frank Simpson a picture by Peter Neefs. All his children to choose two books each from his collection. To his wife his share in the funds comprised in the Settlements. To the Society for the Propagation of the Gospel in Foreign Parts, 19 guineas. To his sister Caroline Dussac 19 guineas. To his niece Emma Eliza Thompson 19 guineas. To his friend Henry Pack Woodford a trustee £100. To Thomas Hanworth Rackham a trustee £50. To the Rev William Holland a guardian of his children 19 guineas. Executors, his wife, his son Edward Henry Freeborn, Henry Pack Woodford, Thomas Hanworth Rackham. And at his majority his son Hugh. A Codicil gives son Edward Henry Freeborn land in the parish of St Clement Ipswich. CB Lowry Clerk in Holy Orders, Framlingham. Proved 26 May 1871 with the note the testator died 28 March 1871. Will of Rev Edward Constable Alston. Now I Will that my funeral and testamentary expenses and debts shall be paid and satisfied as soon as may be after my decease And I Give all that my estate at Newton and Sudbury in the County of Suffolk which estate except as to a small piece of land taken by me on exchange with John Gurdon some years since was devised to me by the will of my late father Edward Daniel Alston (and which estate is hereinafter called my Newton and Sudbury estate) To the uses following that is to say To the use of my dear wife and her assigns during her life with remainder To the use of my son Arthur Richard during his life with remainder To the use of all his sons severally and successively according to their respective seniorities of age in tail generally with remainder To the use of my said son Edward Henry Freeborn in tail general with remainder to That the use of my said son Hugh in tail general with remainder To the use of my said son Rowland Simpson in tail general with remainder To the use of my said son George Donnet in tail general with remainder To the use of my said son Frank Simpson in tail general with remainder To the use of all other (if any) my sons severally and successively according to their respective seniorities in tail generally respectively with remainder To the use of my cousin Edward John Alston of Great Bromley in Essex Brewer for his life with remainder To the use of all his sons as well already as hereinafter to be born severally and successively according to their respective seniority is of age in tail general respectively with remainder To the use of my own right heirs forever And I trust that the devices of this estate will be animated (as I am) by a desire to keep it in our family as long as may be it having come to us by uninterrupted succession from our ancestors for several centuries And I give unto my said dear wife and her assigns for her life All such parts as may be of freehold as distinguished from copyhold tenure of and in the real estate That which at my decease I may have in the several parishes of Great Maplestead and Little Maplestead in the County of Essex (which real estate is hereinafter referred to as my Maplestead estate) And I direct my first trustees hereinafter named as soon as may be after my decease to procure the enfranchisement of the copyhold part of my Maplestead estate and to pay the cost thereof and of any necessary antecedent admission out of my hereinafter mentioned general estate and with a view to such enfranchisement my Will is that the said copyhold hereditments shall at the discretion of my said trustees either descend upon my customary heir or go to such persons or person and for such estate or estates as they my said trustees or the survivors or survivor of them or the executors or administrators of such survivor shall by any writing under their or his or her hand and seal direct or appoint And my will is that after such enfranchisement thereof as aforesaid the said copyhold part of my Maplestead estate shall be conveyed by the person or persons by or in whom the same may be held or vested To the use of my said wife and her assigns for her life and from and after her demise To the use of the trustees or trustee for the time being of this my will for the purpose of being held upon the trusts hereinafter declared thereof And my Will Is that until the said copyhold hereditments shall be enfranchised as aforesaid any rents and profits thereof which may arise during the life of the my said wife shall belong to her and any subsequent rents and profits shall be dealt with as if they had formed part of the income of my hereinafter mentioned general estate And unless my said Maplestead estate shall be sold previously under the direction hereinafter contained I direct my said trustees out of my said general estate hereinafter mentioned to expend the sum of £300 in placing the Messuages or farmhouse cottages and all other buildings upon my said Maplestead estate into a state of good and substantial repair in which state it is my will that the same shall afterwards be continued by my said wife during her life And I Declare that my said Newton and Sudbury estate and my said Maplestead estate respectively shall if that my decease subject to any debt secured thereon by mortgage or lien be exonerated from or otherwise sufficiently indemnified against the same by or at the expense of my said general estate And I Give unto my said dear wife the sum of £150 Stirling to be paid within one calendar month after my decease and (with the exception of the several articles hereinafter specifically bequeathed to my children and of my Cabinet of Coins which it is my will shall form part of my residuary estate) All my household furniture plate plated articles linen china books pictures wines liquors spirits provisions horses carriages and other like effects whether of use or ornamental in or about my dwellinghouse at my decease And all the live and dead stock crops carts carriages and implements of husbandry and other like effects in about all belonging to the farm or land which at my decease may be in my own occupation And I declare that the provision here by made for my said dear Wife shall be in addition to the provision made for her in and by the Settlements on our marriage And I expressly disclaim all right that I may have to any property which at my decease she may have acquired by means of savings out of her separate income And I give to my present dear children the several articles following that is to say To Arthur Richard my diamond ring to Edward Henry Freeborn First the silver Castors and Waiter given to me by my late father the same having been formally the property of my ancestor Daniel Constable Secondly the silver Epergne bequeathed to me by my late sister Eliza and Thirdly the picture of my grandmother Elizabeth Freeborn To Eliza Tabatha my picture of her Mother and my two pictures by Herring To Alice Harriette my picture of her aunt Emma and my picture my Morland To my said daughters my collection of autographs each selecting one or alternatively until the whole shall be disposed of and the said Eliza Tabatha having the choice of the first one To Hugh all the books that belonged to his dear brother and Godfather my late son John Edward Daniel in the hope that his university career may be distinguished by the same steadiness of conduct as was that of his said late brother and also my picture of Sarah Alston Duchess of Somerset To Roland Simpson my picture by Mireveldt To George Donnet my picture by Dunthorne and my best gold seal and key To Frank Simpson my picture by Peter Neefs and to each of my children two books consisting each of one or more parts or volumes to be selected out of my library by them respectively severally and successively according to seniority of age And I give the share an interest to which I have or may become entitled otherwise than by purchase for value from or in right of any of my children by my said late wife in the funds comprised in the Settlements made by William Rackham and myself respectively upon all with reference to my marriage with my said late wife or in the property left by the said William Rackham at his decease or comprised in the settlement on his marriage unto such of my children by my said late wife as shall survive me and the issue who shall survive me and as two males or a male shall attain the age of 21 years or as two females or a female shall attain that age or Maria of such my children as shall die in my lifetime and in equal shares if more than one except that in every case issue shall take (and if more than one person then in equal shares as amongst themselves per stirpes and not per capita the share only which the progenitor would have taken if living to take under the present gift But my will is that the share of each of my said daughters shall be subject to the limitations hereinafter declared thereof And I give to the Society for the Propagation of the Gospel in Foreign parts the sum of £19.19 shillings to be paid within one calendar month after my decease out of such part of my personal estate as I can lawfully devote to charitable purposes And I recommend my children according to their several means to subscribe to that most excellent Society And I give to my dear sister Caroline the wife of Henry James Donnet of Dussac in France the sum of £19.19 shillings as a slight token of my love to her and her husband And I give to Emma Eliza Thompson my niece £19.19 shillings And I give to my friend Henry Pack Woodford of Gravesend in the county of Kent Wine Merchant the sum of £100 And I give to Thomas Hanworth Rackham of Norwich Gentleman the sum of £50 And I declare that the two last legacies are given to the legatees for their care and trouble in the discharge of the trusts here in reposed in them respectively And I give to my friend the Rev William Holland the sum of £19.19 shillings in the hope that he will not decline the trust which I have hereinafter ventured to repose in him by appointing him one of the Guardians of my children and That I give all the real estate of every tenure (except copyhold) not hereinafter disposed of which at my decease shall belong to me or be disposable of by me for my own benefit and not as a trustee or mortgagee including as part thereof the remainder expectant upon the decease of my said wife in the freehold parts of my Maplestead Estate and also when the same shall be enfranchised as aforesaid the copyhold parts thereof (the subject of this device being hereinafter referred to as my devised Residuary Real Estate) Unto and to the use of my said first trustees hereinafter named their heirs executors and administrators respectively But upon and for the several trusts and purposes following that is to say Upon trust absolutely to sell and dispose of all my devised residuary real estate and sell and call in or otherwise convert into money my residuary personal estate but as to my Maplestead estate not during the lifetime of my said wife unless she shall consent thereto and allow the whole proceeds of the sale to be paid to my said trustees And my will is that such sale as aforesaid of my devised residuary real estate and of such parcels of my said residuary personal estate as shall be realised by sale may be effected by my said first trustees under or subject to such conditions as they may think expedient respecting the proof or acceptance of the title thereto respectively either altogether or in parcels and either by public auction or private contract And my said first trustees may from time to time if they shall deem it expedient so to do buy in all or any part of the same several premises when offered to public sale and resend or very either gratuitously or upon such terms as may be thought fit my contract or contracts for the sale thereof And during the minority of my said son Hugh I authorise empower my said wife my said son Edward Henry Freeborn and the said Henry Pack Woodford and Thomas Hanworth Rackham or the survivor or survivors of them or the executors or administrators of the last survivor of them but after the minority of my said son Hugh shall have ceased then I authorise empower order and direct my said wife my said sons Edward Henry Freeborn and Hugh and the said Henry Pack Woodford and Thomas Hanworth Rackham or the survivors or survivor of them or the executors of the last survivor of them to sell and dispose of all the real estate of copyhold tenure not here in before disposed of which at my decease may belong to me or be disposable of by me for my own benefit and not as a trustee or mortgagee (the subject of the present power and direction being hereinafter referred to as my residuary copyholds) in such at the same manner as my said first trustees are hereinbefore directed to sell and dispose of my devised residuary real estate and accordingly with the like powers of selling the special conditions and buying in the premises when offered to public sale and of rescinding and varying contracts for the sale thereof Provided Always and my will is that it shall be lawful for the persons or person for the time being entrusted with the sale and conversion into money of my residuary real and personal estate to defer so long as they or she or he in their or his uncontrolled discretion shall think fit and particularly if thought proper until all my children for the time being shall have attained the age of 21 years And in particular also if thought proper until any annuity subsisting thereon at my decease whether created by me or not shall have determined (in which case until the same shall be sold the annuity shall as between all parties be paid out of the rents or income thereof) the sale of the real estate hereinafter directed to be sold hereinafter referred to as my saleable real estate or any part or parts thereof respectively and That also to defer so long as they or she or he shall think proper the sale calling in or other conversion into money of all or any such part of my said residuary personal estate as may consist of money is owing upon mortgage securities or of government or parliamentary stocks or funds or of shares in any joint stock company or undertaking or of any other description of permanent property whether yielding a present or immediately available income or not and also to defer so long as they or she or he shall think proper and particular if thought expedient until the same shall severally for into possession or become receivable all such parts of my residuary real or personal estate as may consist of reversionary or expectant interests or of Policies of Assurance upon the lines of life of any other persons or person And my will is that until my saleable real estate shall be sold accordingly it shall be lawful for my said first trustees to demise or lease the same or any part or parts thereof at such rentable rents and for such term or terms not exceeding 8 years in possession as they may think proper but as to my Maplestead estate not during the lifetime of my said wife unless she shall consent to and concur in any such lease in her character of such tenant for life as aforesaid and That it shall also be lawful for my said first trustees in their or his discretion to suffer my residuary copyhold estate or any of them or any part thereof and respectively to descend upon my customary heir in the meantime and until the same shall be sold as aforesaid or to point the same to any such person or persons for any such a state or states as they shall think proper to the intent that such person or persons may be admitted to the same estate and hold the same Upon trust to dispose thereof from time to time as my said first trustees shall direct and That it shall also be lawful for my said first trustees to renew the lease or leases of any such part or parts of my saleable estate as may be hold by me under any lease or leases and which they or she or he may think it desirable to retain for the better enjoyment of the other parts thereof or for sale there with and That also if thought expedient to procure from the Lord or Lords of any Manor whereof my residuary copyhold is or any part thereof shall be holden and the enfranchisement thereof And it shall also be lawful for my said first trustees to enfranchise upon such terms as may be thought expedient all or any of the tenements holden by copy of court roll of any Manor or Manors belonging to me and That my will is that my said first trustees shall until my saleable real estate shall be sold accordingly repairs such parts thereof as may from time to time require reparation and insure against loss or damage by fire such of the same premises as shall be of an insurable nature But I expressly declare that no trustees or trustee shall be liable for any other than a wilful disregard of this expression of my will Provided also and my will further is that it shall be lawful for my said first trustees in their uncontrolled discretion at any time or times before my saleable estate shall be sold as aforesaid to borrow and take up and interest upon the security thereof or of any part thereof respectively any sum or sums of money which they or she or he may deem it expedient so to raise for the payment or satisfaction of my debts whether secured by mortgage or lien or not and funeral and testamentary expenses or legacies and thereupon to mortgage the same estate for any term or terms of years or in fee with or without any usual power of sale as a security for the payment of the money so to be borrowed and the interest thereon and in such case the money so to be raised shall be applied in or towards payment or satisfaction of such debts and funeral and testamentary expenses or legacies accordingly Provided also and my will is that anything hereinbefore contained to the contrary notwithstanding it shall be lawful for my said first trustees at any time before my saleable real estate shall be sold accordingly to give in such order succession or manner as they may think proper to all and every or any of my sons including my son Edward Henry Freeborn but as to such of them as at my decease may be under that age not until they shall severally attain the age of 21 years the option of purchasing the same or any part thereof for such price or prices as my said first trustees shall think reasonable but I do not intend by this provision to confer upon any of my said sons the right to demand any such option nor in consequence of this provision shall my said first trustees be bound to defer the sale of the same real estate or any part thereof until after all my said sons shall have attained the age of 21 years and I declare that so long as any of the several premises whether real or personal hearing before made saleable and directed to be called in and converted respectively shall remain unsold or not called in or otherwise converted into money the annual or other recurring produce of such parts thereof as may yield income respectively shall be considered as income arising from monies produced by the sale calling in all conversion of the same respectively and shall go and be applied accordingly but that with respect to such parts of my residuary real or personal estate is by reason of the same consisting of deferred or reversionary interests or policies of Assurance or otherwise may not yield income no allowance for or in respect of the income which the same if converted might ought to have produced shall be made in favour of any person having only a partial interest therein nor shall any such allowance be made in respect of property as to which if consisting of shares in a joint Stock Company the dividends or income shall not be declared or divided until after the determination of the interest of any such partial owner whether the same dividends or income may or may not have been earned or have accrued previously And I declare that my said first trustees shall from time to time receive the money to arise from the sale as aforesaid of my saleable real estate And also my ready money at the time of my decease and the money to be produced by my said residuary personal estate and shall stand possessed of all the same several monies (hereinafter called my general estate) Upon trust in the first place to pay my funeral and testamentary expenses and all my just debts (including therein any sum or sums of money which at my decease may be charged on my said Maplestead Estate or on my said Newton and Sudbury Estate whether the same shall have been so charged by me or not but not including unless for any reason my said first trustees shall think proper to pay the same any debts barred by or irrecoverable through lapse of time) and to pay the pecuniary legacies hereinbefore bequeathed and the cost of such admission to and enfranchisement of the copyhold parts of my said Maplestead Estate and the sum of £300 hereinbefore directed to be laid out in such repair of the buildings thereon as aforesaid And upon trust in the next place by and with or out of such part of the income of my general estate as shall not be payable to my said wife as next hereinafter mentioned or if not sufficient then by and with or out of a sufficient part from time to time of the capital producing the same income to pay all the premiums which shall be payable in order to keep up any policy of life assurance which my said trustees may think proper to retain unconverted and also any annuity or annual sum which my estate or any part thereof may be liable to pay and upon trust to pay the income of such part of the said trust monies as shall have been produced by any sale in which my said wife shall have concurred as such tenant for life as aforesaid unto That her and her assigns for her life and subject to the several trusts hereinbefore declared thereof My Will Is that my general estate shall be held in trust for all such of my children by my said late wife as shall survive me and all such of my children by my said present wife as surviving me shall in my lifetime or afterwards attain the age of 21 years and the issue who shall survive me and as to males or a male shall attain the age of 21 years or as to females or a female shall attain that age or marry of such of my children as may die in my lifetime and in equal shares if more than one except that in every case issue shall take (and if more than one person then in equal shares as among themselves) per stirpes and not per capita the share only which the progenitor would have taken if living to take under the present trust And except that my said son Arthur Richard shall bring into hodgepodge and account accordingly for the same as part of my estate all monies which having been advanced by me to him or at his request by way of low shall add my decease remain unpaid with so much of the interest thereon respectively at the rate of £5 per centum per annum from the time of advancing the same until the same shall be brought into account as at that time shall not have been paid And that whether such monies and interest or either of them or any part thereof respectively may or may not have become barred by or unrecoverable through lapse of time and That for the purpose of the preceding provision I hereby declare that the date of this my will the amount due to me from my said son both for principal and interest within the meaning of the same is the sum of £1500 and that as regards any advances to be hereinafter made by me my said first trustees shall accept as sufficient any evidence as to the amount or character thereof which they may think proper whether the same shall amount to legal evidence or not and in particular they may except as conclusive any entries which at my decease may be found in my property book or ledger with reference to the account between my said son and myself And My Will Is that the share whether original or occurring under this my will of each of my daughters in all the property hereinbefore disposed of by me not consisting of the personal chattels specifically bequeathed as aforesaid shall be held by my said first trustees upon That the trusts following that is to say Upon trust for her my same daughter for her life for her separate and inalienable use and after her decease (subject to any exercise of the hereinafter mentioned powers to appoint to and intended or surviving husband) in trust for all and every or such one or more exclusively of the others or other of the children or issue of her my same daughter as she whether covert or sole shall by will appoint and in default of and subject to any such appointment then for her children who shall either in her lifetime or afterwards as to a son or sons attain the age of 21 years or as to daughters or daughter attaining that age or marry in equal shares if more than one but if there shall be no such child then in trust for such persons or person as my same daughter shall whether covert or sole and as well before as after the event on which the present power shall have arisen by will appoint and in default of and subject to any such appointment Then my will is that the said shares shall be held upon and for the trusts and premises upon and for which the same would then have been held in case my same daughters had died in my lifetime without issue And My Will Is that the income to which my said daughter Alice Harriet may be entitled under the trusts hereinafter declared shall be paid to her on her own receipt and that notwithstanding that she may at the time be under the age of 21 years Provided Always and my will is that it shall be lawful for each or any of my daughters by any deed to appoint that after her decease the income of her share shall be paid to any husband with whom at the time of the appointment she may be about to marry for his life or any less period and also whether she shall have exercised that power or not by her will to appoint that the income of her share shall be paid to any husband who may survive her for his life or any less period And My Will Is that so long as each or any person who if of full age or as for a female married would be entitled in possession under this my will to any property either absolutely or in the case of a daughter of mine subject only so far as the same may be applicable to the limitations hereinbefore declared shall be under age and as to a female unmarried my said first trustees shall receive and take the income of such property and shall apply a competent part or if need shall be then the whole of such income in or towards the maintenance and education of the same infant person and then either by making such application personally or by paying any monies advanced or otherwise to his or her Guardian or Guardians or to any fit person to be applied as last aforesaid and shall accumulate and improve the whole or such part as I may by Law direct to be so accumulated and improved of the residue or surplus (if any) which after providing as aforesaid for the maintenance and education of each such infant shall remain of such income by investing the same and the subsequent annual produce thereof in the names or name of my said the first trustees for the time being in any such stocks funds or securities as are hereinafter authorised to be purchased or acquired by them or him which shall thereupon be added to and formed part of and accordingly go and be held and taken under this my will along with and be subject to the same powers and provisos as the principal fun or funds from the surplus income of which the same shall have arisen as aforesaid and shall hold any portion to which the preceding direction shall or may not apply of such residue or surplus In trust for the infant from whose funds or property the same may have proceeded And I declare that the provisions hereinbefore contained for maintenance and education shall be in and only of any fund or property which independently of this my will shall be applicable to the same purposes And I declare and direct that all monies whatsoever which under the dispositions in this my will contained or in or about the execution of any of the trusts and powers aforesaid shall from time to time come to the hands of my said first trustees or trustee for the time being and which in the execution of such trusts and powers or any of them it shall not be requisite forthwith to part with or pay away shall or may upon the receipt thereof respectively be laid out and invested by my said first trustees in their names in the purchase of an equivalent part or equivalent parts of someone or more of the Parliamentary stocks or Public Funds of Great Britain (except determinable annuities) or at interest upon British Government Securities or Indian Government stock or Indian Railway shares or debentures the interest upon which is guaranteed by any act or acts of the Imperial Parliament although the home Government may not be liable or upon the security of some mortgage mortgages of freehold or copyhold estates whether consisting of lands or houses or buildings only to be situate in Great Britain but not in Ireland with such titles as my said trustees or trustee shall think it reasonable to accept under all the circumstances attending each particular security or upon the security of debentures granted under the authority of any act or acts of Parliament constituting any Railway company in England And I authorise and empower my said first trustees to alter vary and transpose all or any of the stocks funds or securities to be from time to time acquired under any of the provisions in this my will contained as they in their discretion shall think fit but so that as to the funds wherein a life interest is hearing given to my said wife no alteration of any parliamentary or public security nor any investment upon any private security shall be made without her previous consent in writing Provided always and I declare that if my general estate or any part thereof shall be laid out or invested in or upon several stocks funds or securities at any time when any person or any class or number of persons shall acquire an absolute and indefensible interest in possession therein respectively then and then every such case it shall be lawful for my said first trustees to separate and transfer assigned pay and assure to each such person or class or number of persons as an for his her or their share or shares such one or more or such part or parts of the same several stocks funds or securities as in the opinion of my said trustees or trustee shall then form or be an equivalent to the just share or shares of the last mentioned person or class or number of persons in the whole of the said several stocks funds and securities and afterwards neither shall my trustees be chargeable or prejudiced nor such person or class or number of persons be benefited or prejudiced by any subsequent fluctuation or change in the value of the remainder of the said several stocks funds and securities And I appoint as the first trustees of this my will my said wife and my said son Edward Henry Freeborn and the said Henry Pack Woodford and Thomas Hanworth Rackham and if he shall have attained the age of 21 years in my lifetime then also my son Hugh But if he shall then be under that age then my will is that he shall on attaining that age be and become a trustee of this my will along altogether with my other trustees or trustee if any and all the estates monies and premises then held upon the trusts of my will shall thereupon be conveyed to and vested in my said son Hugh either jointly or solely as the case may require Provided Always and my will is that if my said wife shall marry again she shall thenceforth cease to be a trustee of this my will and that unless she shall be the sole trustee her estate and interest as a trustee in any real estate then held upon the trusts thereof shall immediately upon her marriage cease and determine in the same Manner and to the same effect as if she had died and That I Declare that if any one or more of the trustees for the time being for any of the purposes of this my will whether hereby appointed as herein before is mentioned or to be appointed as hereinafter is mentioned shall die whether in my lifetime or afterwards or shall go to reside beyond the seas or shall be desirous of being discharged from or shall decline whether in limine or not or become incapable to act in the several trusts here by created before the said trusts shall be fully performed or as to my said wife shall cease to be a trustee as aforesaid Then and in every or any such case it shall be lawful for the surviving or continuing trustees or trustee for the time being (whether willing to act in other respects or not) or if they shall be no such trustee then for the executors or administrators of the then last surviving trustee by any deed or deeds from time to time to appoint any one or more person or persons to be a new trustee or new trustees of this my will in the place of every or any person so dying going to reside beyond the seas desirous of being discharged or declining or becoming incapable to act as aforesaid and That when and so often as any person or persons shall be appointed as last aforesaid all the estates monies funds and premises then held upon or subject to any of the trusts here by created shall by proper means be vested in the person or persons who after such appointment shall be my trustee or trustees provided Always that every person (if any) who shall either under any exercise of the last mentioned power or by the appointment of a court of competent jurisdiction become a trustee of or for any of the purposes of this my will shall have and may exercise all the same or the like powers and discretions as if he had been originally here by appointed and that as well before as after the trust estate and premises shall have been vested in him And my will is that the several powers and discretions or authority is hereby given to and vested in my said 1st trustees shall and may be exercised by the person or persons who for the time being may be trustees or the sole trustee of this my will and if at any time there shall be no such trustee then by the executors or administrators of the last surviving trustee And I Declare that every receipt in writing which shall be given by my trustees or trustee for the time being for any moneys payable to them or her or him in or about the execution of any of the trusts or powers of this my will shall effectually discharge the person or persons to whom the same shall be given from the money thereby acknowledged to be received and from the necessity of seeing to the application thereof and from all liability by reason of the loss missapplication or nonapplication of the same And I give all the real estate is accept the copyhold tenure which at my decease shall be held or disposable of by me upon any trust or by way of mortgage unto my said wife my said son Edward Henry and the said Henry Pack Woodford and Thomas Hanworth Rackham and there heirs executors and administrators respectively upon and for the trusts and purposes or subject to the equities of redemption affecting the sum respectively But with respect to any such estate of copyhold tenure as last mentioned my will is that the same shall in the discretion of my same trustees or the survivors or survivor of them or the executors or administrators of such survivor either descend upon or for or subject to which I may hold the same and That I nominate That And Appoint my said wife my said son Edward Henry Freeborn and the said Henry Pack Woodford and Thomas Hanworth Rackham and when he shall attain the age of 21 years also my said son Hugh to be the executors of this my last will and Testament And I authorise and empower them all other my personal representatives or representative for the time being and my said trustees or trustee to pay any debts owing by me or claimed from my estate upon any evidence which they or she or he shall think fit to admit and to accept any security real or personal for any debt or debts owing to me or after such time for the payment hereof or compound for the same respectively as on in such manner and in such terms as they or she or me in their or her or his uncontrolled discretion shall think fit And I Appoint them my said wife and the said William Holland and the survivor of them to be the Guardians and Guardian of my infant children And I Direct that my said son Edward Henry Freeborn and the said Thomas Hanworth Rackham shall be allowed to transact between them any business in reference to this my will usually confided to solicitors and to make the usual professional charges in relation thereto In Witness whereof I the said Edward Constable Alston have to this my last will and Testament contained in 14 sheets of paper set my hand this 26th day of February 1870. Signed and acknowledged by the above named Edward Constable Alston the testator as and for his last will and Testament in the presence of both of us together present at the same time who thereupon and then at his request in his presence and in the presence of each other have subscribed our names as the witnesses thereto the 5 corrections opposite to which are initialed appear in the margins having been first made. Charles Cone - boot maker - Framlingham. Emily Christiana Anderson - 21 Craven Road Hyde Park. Proved at Ipswich with a codicil the 26th day of May 1871 by the oaths of Anne Maria Alston widow the relict Edward Henry Freeborn Alston son (by testator's former wife Harriette) Henry Pack Woodford and Thomas Hanworth Rackham for the executors named in the will to whom administration was granted Power reserved of making the like grant to Hugh Alston the son also (by the said Anne Maria Alston) now a minor the other executor named in the said will when he shall attain the age of 21 years. The Testator the Rev Edward Constable Alston was late of Dennington in the county of Suffolk Clerk Rector of Dennington aforesaid and died on the 28th day of March 1871 and Dennington aforesaid. The transcriber E L Fenn 2017 apologises for any errors in this transcription, it being done on voice recognition software, he cannot help but observe that this will is a good example of the verbose excesses of the Legal profession in years past, where fees were sometimes levied by the line or word ! 3. Edward Constable Alston: Probate, 26 May 1871, District Registry Ipswich SFK.